Books don’t always have to be happy. They can be sad. This one sounds like an important read. It definitely chronicles an important time in history; and I thought her writing style was amazing. I don't think I've ever read a novel set in Budapest. The author's name is familiar, but I don't think I've ever come across her books. Maybe our library will have this one. I'd just never read anything set in Budapest at that time. So that part was interesting; but the characters' lives were pretty bleak. Thanks for your review and I so agree, we need to know what life was like in Europe before during and after World War II. 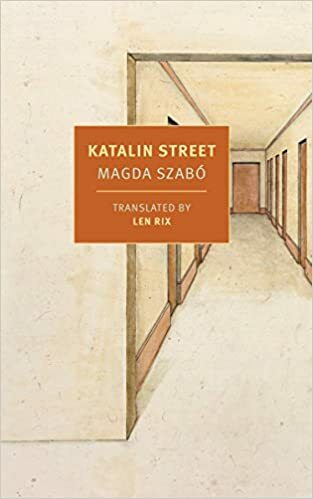 We take for granted the countries and time periods we are born into and Katalin Street a reminder of how suddenly things can change for the worse. We do take for granted when and where we live. This book certainly made me more grateful for the freedoms and blessings I enjoy. It does sounds like a sad read but most importantly it has conveyed the meaning behind this story. We forget about what happened after the war, especially in those countries occupied by the Soviets. It is good to be reminded of how times can change. Great review! This does sound good and I agree with everyone that it is interesting and important to know how life was radically altered for so many in Europe post WWII. I have Szabo's The Door on my TBR but haven't gotten to it yet. I like reading about this time period too and to see how the lives of so many people were affected. I hadn't heard of this book but it sounds like a good one to take note of!